The Bras for the Cause Gala wouldn’t be possible without the support provided by volunteers, donors, attendees and partners! Learn how you can help support the Gala by decorating a bra or hosting a party for a purpose below. 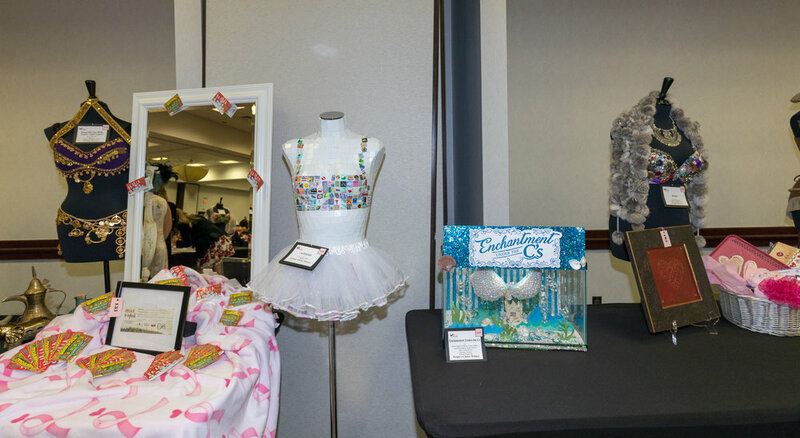 Every year, people choose to use their creativity to support the Bras for the Cause Gala by designing and/or decorating a bra. Dates you should know! Please check back for additional details. Who can design or decorate a bra? Anyone! It could be you, your relatives or friends, a professional or budding artist, a celebrity, or someone who simply wants to participate in a meaningful way. We get bra artwork from people across the country. There is no limit to what you can do. Your bra can be simple, complex, decorated, designed, dramatic or whimsical. You choose your own inspiration and what materials to use. View past bra submissions! No, although participating artists can attend the Gallery of Bras Artists' Reception prior to the Gala and vote on their top choices, which may be included on note cards or other items produced by Bras for the Cause. In addition, a "popular vote" is open to all visitors who stop by the Gallery of Bras. How are the bras sold? The bras will be coupled with exciting packages such as travel, vacations, goods, services, etc. and put up for auction at our annual Gala. Photographs of Artists’ Choice and People’s Choice may be included on calendars, notecards, and other fundraiser items. All funds raised go toward fulfilling the mission of Bras for the Cause to help screen for, detect, treat and cure breast and cervical cancers. No, you can make your own, buy one, whatever works best for you. Register online using the form below or submit this form to the Bras for the Cause office. Where does my completed bra go? Your artwork needs to be delivered* to either the Bras for the Cause office or to a Bras for the Cause Board Member. Please include your registration form, if possible, but make sure to include your name and the title of your bra artwork. If you have questions about decorating a bra, please direct inquiries to the Gala Chair. We will do our best to respond to emails in a timely fashion. Holding a Party for a Purpose helps to create and supply fun and interesting fundraiser items to be auctioned off at our annual Bras for the Cause Gala. What is a Party for a Purpose? A Party for a Purpose allows you to create an auction basket/items with a group. Select a theme for your items and ask friends, family, and/or coworkers to provide items related to that theme to create an auction package. Examples of common themes are tailgating, pet lovers, and travel packages—get creative! Auction items can be larger single items or collections of smaller items; However, the minimum combined worth of the item(s) preferably should be no lower than $150.00. If the Party for a Purpose has provided a collection of items on a theme to create an auction “lot,” please make certain that the items are contained together in some manner such as a basket or container and an itemized list of the contents is provided. All funds go toward fulfilling the mission of Bras for the Cause to help screen, detect, treat and cure breast and cervical cancers. Where do the completed auction items go? Party with a Purpose auction items should be delivered* to the Bras for the Cause office along with a copy of the submission form, including an itemized listing of the donated items. *Drop off times will be posted on our Facebook page closer to the event. Other times may be available by appointment. Do you need a donation form for tax purposes? Does this bra pair with a specific auction item?